This book is a sequel to Dr. Goldberg’s Time Travelers from Our Future and depicts the significance of Hermes, the very first time-traveler, on both Egypt’s development and our planet’s heritage. According to Dr. Goldberg’s case histories and research, Egypt developed from four sources: Lemuria(Mu), Atlantis, ETs and time travelers. One of the most dramatic chapters deals with Hermes’ role as Moses’ advisor and rewrites the history of the Exodus by demonstrating that the original Jewish people were Egyptians! Archeological and historical evidence is presented to support this argument. Several self-hypnosis exercises are presented to guide the reader into their own past lives, out-of-body travel and training them to contact these time travelers. Dr. Bruce Goldberg is a dentist and clinical hypnotherapist, who has regressed and progressed over 14,000 individual patients into their past and future lives. He developed the field of progression hypnotherapy, and his book Past Lives, future Lives is the first book ever written on future life progression. His book, the search for grace, was made into a CBS movie. Dr. Goldberg has been interviewed on Oprah, Regis, ZMontel, Jerry Springer, CNN, CBS, NBC, ABC, Fox, Art Bell and George Noory and many others. In his seminal work, John Anthony West lays out the case that others have made before him regarding ancient Egypt – namely that their culture was way more advanced and complex than we realize. He discusses evidence found in Hieroglyphs, Art, and Architecture. He also discusses the Sphinx and its extreme age. This book laid the foundation for countless researchers in the 40 years since it’s release. 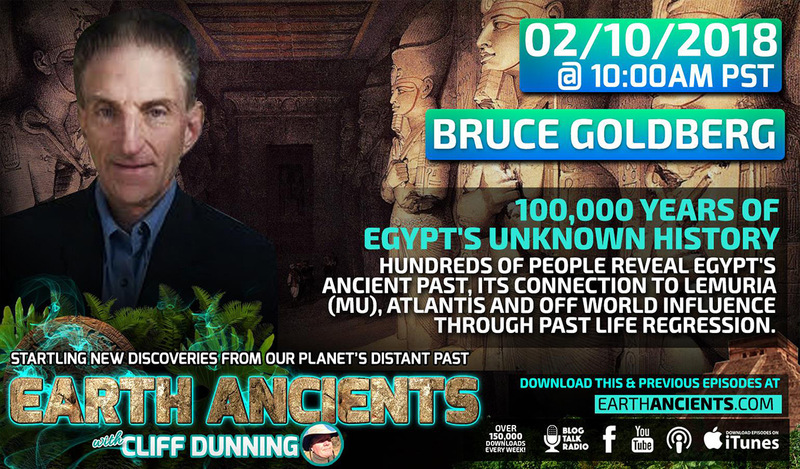 Nominated for Best Documentary and winner of the Best Research Emmy Award, this documentary narrated by Charlton Heston and featuring John Anthony West, Robert Schoch, and Richard Hoagland is a big budget attempt to shine a light on the subject of the extreme age of ancient Egypt. It is closely related to J.A.W.’s “Serpent in the Sky” and brings the reputation of a tenured geologist to bear on the problem of water erosion on the Sphinx enclosure. This youtube link is a remastered in HD version of the first part of a dramatic and informative series on ancient Egypt. Topics like sacred geometry and the science of the universe play heavily here. There are 8 total episodes.